This classic leather cuff bracelet is really a must have if you want to add something a bit edgy or trendy to your accessory collection. Both sturdy and stylish, perfect for daily casual suits wearing, date, working and other rock balls and parties etc. A really delicate cuff should never be missed. Thoughtful narrow cuff will highlight the charming curve of your wrist, making it look slim and fashionable. And it will also be very cute with kids when they are in costumes and do treat or trick to ask candy in Halloween festival. This cuff is made of nice PU leather, offering you a soft and smooth touch. There are 2 different snap buttons, so that you are able to adjust the bracelet length to fit your own wrist. These simple but stylish spike rivets will give you a punk rock look. * Residual new leather smell may exist. Just put the cuff under ventilated place for a few days, and then the smell will disappear. 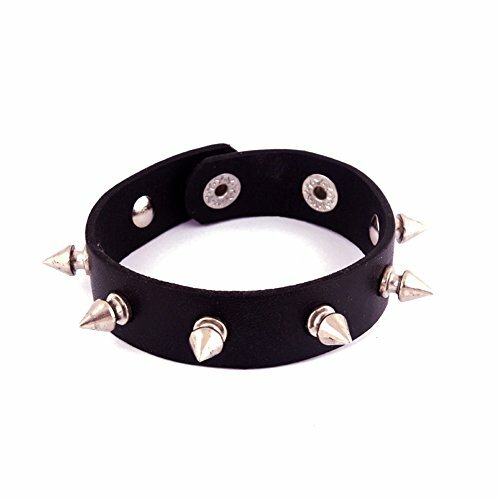 Material: PU leather, alloy metal Length: 9.1"(23cm), Width: 0.7"(1.8cm), Weight: 23g Punk style with spike rivet decor & adjustable snap button Four fashion colors to fit men, women, boys and girls. Great gift and accessory for Halloween party or any rock balls.